Saturday we had a job just getting on the water, we tried to launch from Ferrysburg, Michigan where we ended on Friday and it was locked up. We went to the Coast Guard station and there was no place fit to put in a kayak so we ended up at the campground next door and finally had success. The water was calm for several miles then as usual it changed and we had some confused waves. We had a Harbor crossing at Holland and it was a real test of my abilities. As far as rules go, no one observes them. We ended up with at least 4 foot waves rolling in and also 3 to 4 foot standing waves. Had one fishing boat fly up from behind, a Boston Whaler and a 30 or 35 foot cruiser cut us going in. We made it without swimming, I’m still amazed. We had about a mile of that messy water then about 8 miles more of wind, waves and confusion to reach our campsite for the night. 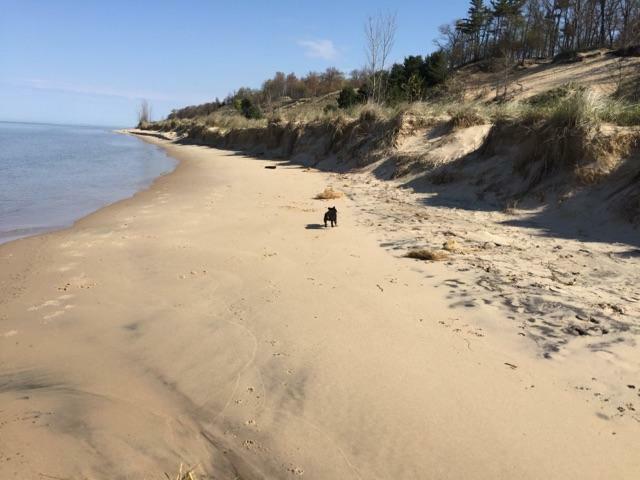 We landed at Saugatuck Dunes with a total of 25 1/2 miles for the day. 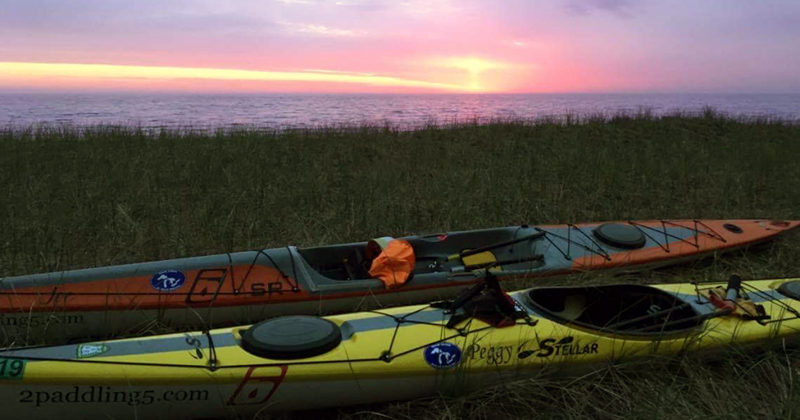 Sunday we paddled from Saugatuck Dunes to Van Buren State Park for a total of 26 1/2 miles. The water was rough with 2 foot waves that crashed over but after yesterday I won’t complain. 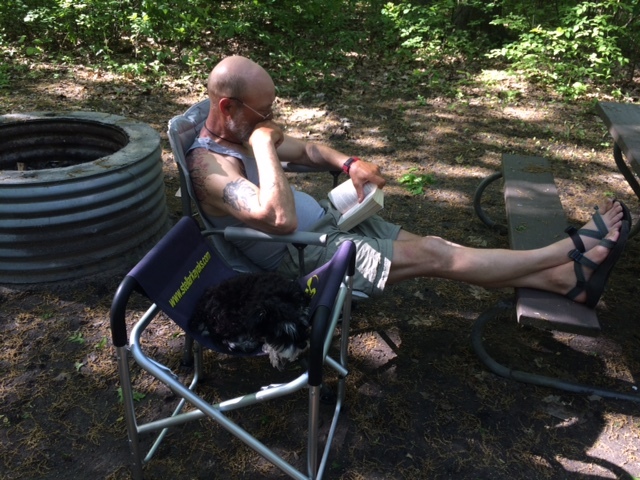 We found another great camping spot. Up over the sand bank and into a shallow ditch that hide us from sight to anyone on the beach and also cut out a lot of the lake sound. We also had another beautiful sunset. Monday we paddled 20 1/2 miles to Warren Dunes State Park where our camper is parked. We had wind as always but a good day. At Silver Lake we had a 45 minute visit with a local lady who shared a lot of local secrets with us. Visits like that are priceless. We headed out again after lunch and met a couple kayakers, John Anderson was one. He knew kayaks and it was fun chatting. He figured out right away that we were not just day paddlers and must be out for the long haul. Tuesday we left from camp in mild conditions but the wind quickly picked up and our speed dropped from 5 mph to 3 or 3 1/2, it felt like we were going on reverse. We paddled 14 1/2 miles and called it at New Buffalo. 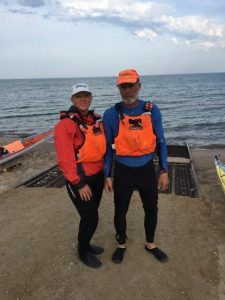 Wednesday we stayed on dry land due to wind and also to let a strained wrist relax for me. We had a message from a lady who saw our boats and contacted us from the website listed on them. She invited us to paddle with her group the following day if conditions were still wild. Thursday was a crazy windy day so we decided to paddle the Paw Paw river with the Two Rivers Coalition. It was a short, easy paddle with a group of amazing and interesting people. When we finished and loaded up we headed to The Livery in Benton Harbor for a drink and a bit more visiting. Friday the lake was as angry as I’ve seen it so we were not out again. Sitting on shore is getting old but there is nothing that can fix that. We relocated the camper to Jelly Stone Park in Portage Indiana.